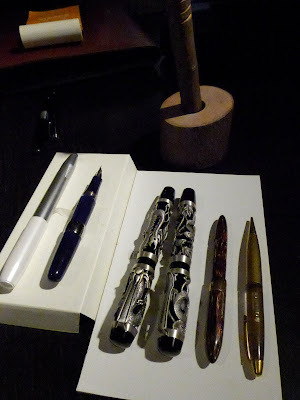 From top to bottom: Tiffany's cool UV marker/light pen and her erasable ballpoint (both of which she demonstrated for us), Mido's solid silver Pierre Hugo fountain pen in lovely tree bark design and his Waterman fountain pen with an unusual aerometric-filler mechanism that fills from the side. 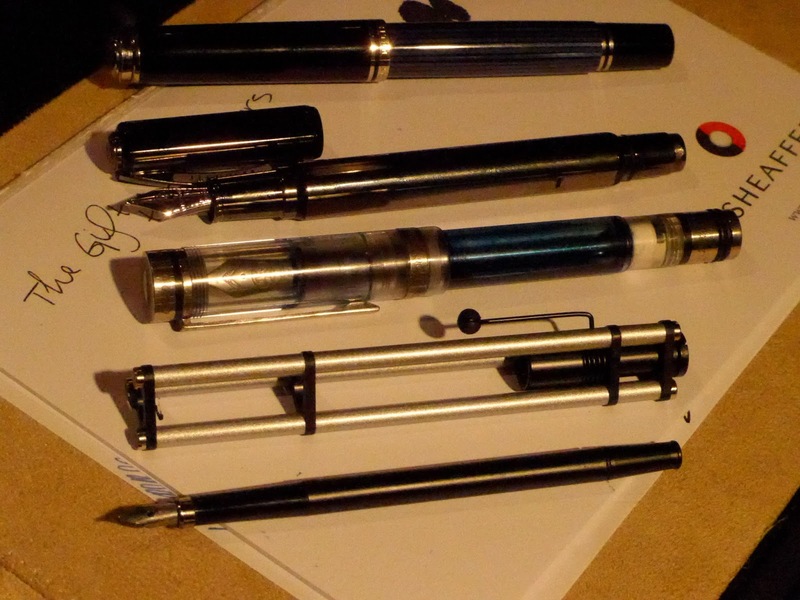 From top to bottom: Bruce's Pelikan M800 with a modified piston-filling mechanism made of plastic (not brass) which has 20% increased ink capacity, his Visconti 'Metropolis' fountain pen with a retractable nib, Bruce's amazing CONID Bulkfiller fountain pen and his highly-unusual Parafernalia fountain pen. 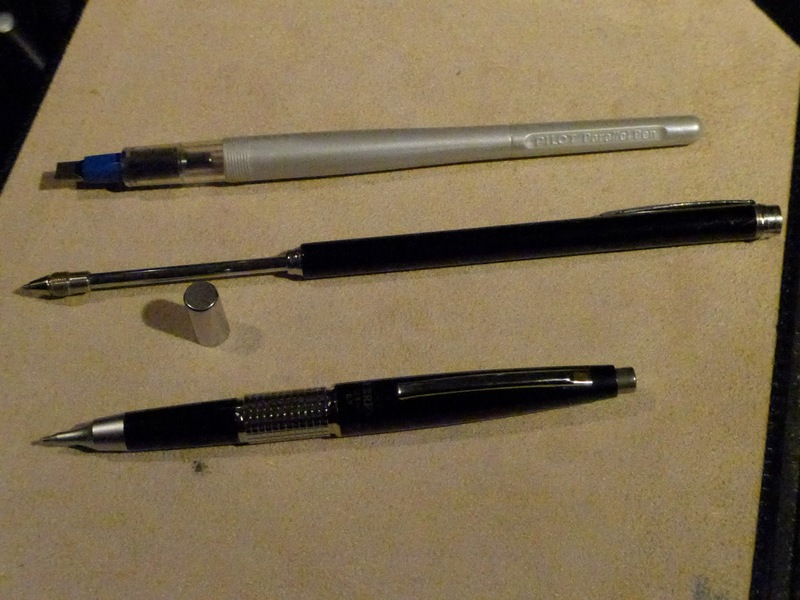 Top to bottom: Peter's extendable pointer/ballpoint combo, his Pilot Parallel with 6mm (!!) 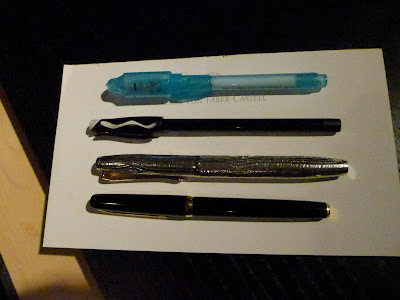 italic nib and his Pentel Kerry mechanical pencil, whose lead advances when you press the cap top. Peter's Pilot Parallel in action, as shown by Tiffany. A very interesting nib and handy for making large letters (e.g. posters, signs). From left to right: Kristina's Online fountain pen/stylus combo writing instrument, Bill K's Stipula 'Passaporto" Fountain Pen Network limited edition pen, Charles' two Acura pewter pens---a dragon fountain pen & a snake ballpoint/rollerball, Stuart's Sheaffer ' Balance' fountain pen with an unusual cross-hatched cap band, and his floaty ballpoint made by the GE Secretary Pen Co. with an Oldsmobile car floating inside. In the background is Bill's one-of-kind ballpoint pen and stand, made by a friend from some laurel wood from Bill's own backyard. 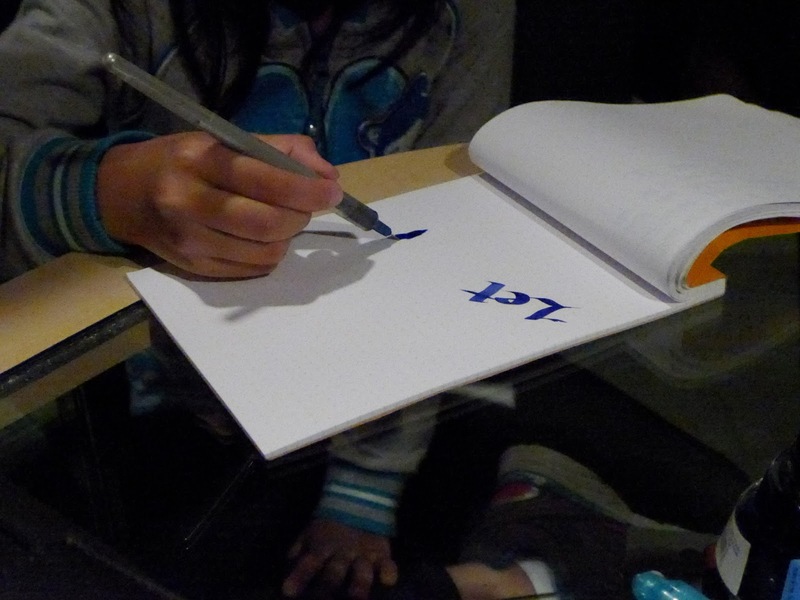 Great idea for writing instrument material! Bethany's gorgeous custom-made Edison 'Menlo' Pump Filler fountain pen. The pen was made using the material selected by Bethany, as well as her preferred nib material and nib size. From left to right: Maja's Lamy Safari with custom-made barrel made by Penchetta Pens in Scottsdale, Arizona, an Imperial lever-filler fountain pen made to hold a spare nib at the end of the barrel (and protected by the clear blind cap--note: the spare nib is missing), a Wearever fountain pen with a Sheaffer feed and a replacement nib. 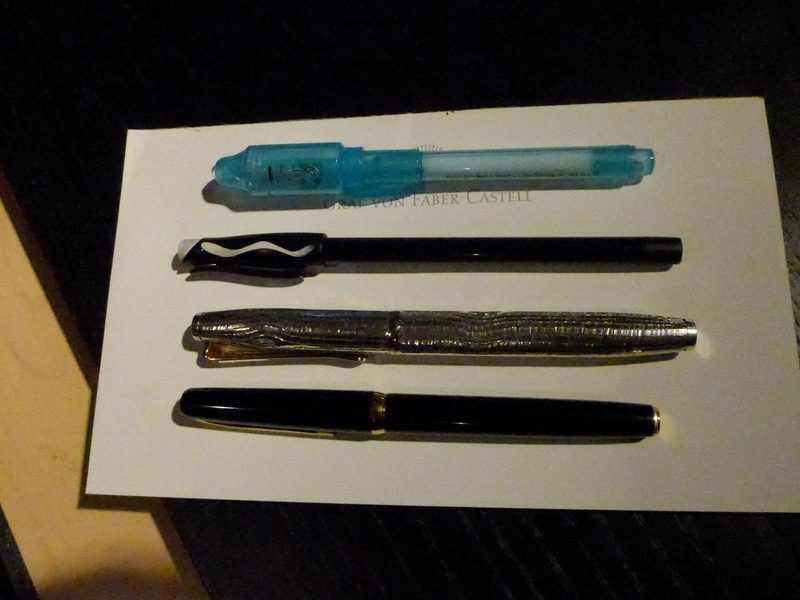 The last pen isn't unusual--it's Ben R's new acquisition (New Acquisitions is always our secondary topic), a Sheaffer Imperial. All photos by me--Maja---except for the last three (Mido's).